A boat or other watercraft is a luxury item that requires a hefty investment on your part. Your boat gives you hours of fun and countless memories, but it will not serve your day-to-day needs in the same manner as your standard vehicle. Due to the potential for limited use of your boat, you will want to consider your options for storage. In the Highland, CA area, you may choose dry-dock storage or keep your boat in the water all year long. What you choose will depend on several factors. Vines Storage is recognized as one of the most secure yet most easily accessible for owners. Our indoor and outdoor storage areas offer a great deal of space as well as amenities that our customers find appealing. Boat storage is not one-size-fits all. Our facility has spaces that your small watercraft like a Sea-Doo will fit perfectly. We also, knowing that boats and motor homes often go together, have spaces in which all of your RVs can be stored in the same vicinity. You want your boat and other watercraft to be in tiptop shape when the time comes to hit the water. What you do in the off-season or for storage is as important as what you do to maintain performance during times of use. The storage solution that you choose will play a role in preserving and protecting your investment into family fun. 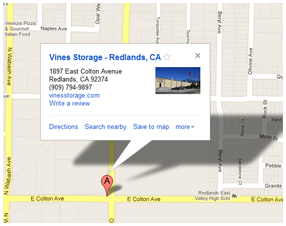 Learn about leasing terms and packages when you call Vines Storage at 909-389-6209.